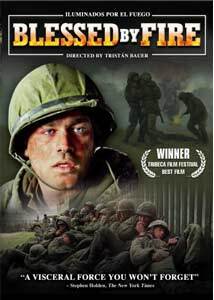 Tristan Bauer's 2005 Iluminados por el fuego�or Blessed By Fire�uses the lingering impact of the Falklands/Malvinas Islands war of 1982 between England and Argentina as the cornerstone for showing how war, in the immortal words of Edwin Starr, "ain't nothing but a heartbreaker." As the film opens we meet Esteban (Gaston Pauls), a current day journalist in Argentina who receives a call from the wife of an old army buddy, with news that there has been a near-fatal suicide attempt. A hospital visit leads to a flashback to 1982, as the Argentinean government attempted to gloss over a heady dose of civil unrest by taking on England in a rather pointless two-month war over a series of rocky, islands 300 miles offshore, islands that had been a self-governing overseas territory of the UK since 1833. It's during these flashbacks that we see Esteban and his two equally reluctant army buddies as they share equal loads of cold, fear and homesickness as the comparatively ill-equipped Argentines lie in wait for the English navy to strike, and to strike hard. They share stories about home as the inevitable gets closer, and though Bauer only has a couple of actual battle scenes (and cleverly minimal at that), the crux of the story is about the waiting being the hardest part, as the fear gets compounded and festers wildly. And by the time the shooting takes place it is utter chaos. Bauer has his characters talk of "ghosts" that have remained in the decades following, and there's mention that former Argentine soldier suicides have actually equaled the number of dead during the war itself. The particulars of the Falklands/Malvinas war seem to have gotten pushed aside and replaced by others over the years�at least outside of Argentina�and Bauer handles the task of offering a new perspective on perceived nationalism and how a government can willingly use its citizens as disposable pawns. The message is that the locale may be different but the effect is just the same rings true, and Argentina's loss in this conflict, as illustrated by Bauer, was much more than just in military terms. Despite the cover art, this is not an all-out war movie, and instead uses the agony of waiting as the largest component. Bauer only serves up a couple of significant battlefield moments, with one being in almost complete darkness, and if you pay close attention you'll realize how more is done with less. The use of stock news footage of the time offers up the only shots of an English military personnel, and a shaky camera and a few explosions are edited in such a way that the battles all seem much larger. Stepping back from the relatively underplayed war elements, what really comes through as the most compelling are the scenes between Pauls' Esteban and Marta (Virginia Innocenti), the wife of the former soldier who has attempted suicide. Pauls does silent and stoic quite well, speaking softly and obviously carrying the weight of those long ago "ghosts" he talks about, but Innocenti gives the best performance of the film, a bitterly dramatic bit of acting that is full of tears and anger. Her recounting of the piece-by-piece downfall of her marriage is tragic and raw, with Innocenti stepping up and owning this one for the few scenes that she's in. We should all know by now war rarely has winners. Leaders may come and go, but it is the men with the guns who carry the scars, and Bauer's Iluminados Por Del Fuego only reinforces that fact. Image Transfer Review: The 1.85:1 anamorphic widescreen transfer is far from reference quality, but the print is clean, though edge details are marginally quite soft. There's an intentional drabness overall, and as a result it seems that only fleshtones and facial features carry any sort of color. Light grain is evident at times, and one of the nighttime battlefield sequences is a bit difficult to follow, and it's hard to know whether to fully put the blame on the transfer, because I suspect this was done in part due to budget and a need to create a sense of chaos and confusion. Audio Transfer Review: Audio is presented in the film's original Spanish language, issued here in 2.0 surround. It's a fairly flat mix, not offering up much in the way of any spatial dramatics. Voice quality is clear, but the war-based scenes could have really benefited from some deeper bass and a more aggressive surround mix to enhance the sensation of chaos. The R2 release did carry a Dolby Digital 5.1 surround, which is curiously absent for this R1 version. Extras Review: Not much in the way of extras, though this is still a pretty close match to the R2 release�all that's missing here is a music video for the moving song Para La Vida used during the closing moments of the film. There's a subtitled theatrical trailer and a behind-the-scenes segment (02:56s) that is basically a longform promo, with emphasis on shooting one of the key battlefield sequences. Koch Lorber has also included four additional trailers for Cautiva, Our Brand Is Crisis, Cuba Feliz and Safe Conduct. The disc is cut into 12 chapters, with optional English subtitles. Tristan Bauer's look back at the Falklands/Malvinas Islands war�during and decades later�from the viewpoint of the Argentinean soldiers paints an understandably bleak, ugly picture of how two saber-rattling nations often forget the human element. A pair of nice performances from Gaston Pauls and Virginia Innocenti do a wonderful job of selling the drama, and more importantly, Bauer reminds the rest of the world of a largely overlooked conflict that impacted countless lives.